Batter batter batter! Softball season is back! The 3rd Annual "Slugout in the Dugout," the Democrats Abroad vs Republicans Abroad softball game is only a few short weeks away! We'll play the afternoon of Saturday, June 30th, over at the Marines' field near Geneva. If you are interested in playing, please let us know! 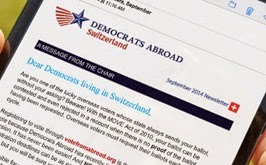 Email: events@democrats.ch. Ideally, we'll hold the teams to US citizens who are actually Democrats and Republicans, but everyone is welcome to come out and watch, enjoy the food, drink, and excellent weather we expect to have, and the friendly rivalry. Whether player or spectator, you must sign up, however, in advance to get on the list. For those of you interested in playing on our team, we have some practices set up through June. More information will follow - but only to folks who let us know that they'd like to play!! For the Dems, practices are going to be May 26th, June 9th, and June 23rd, all Saturdays, always from 2pm-3:30pm, always at Vessy (Geneva). The best way to get there is to hop an 11 bus to Bout-du-Monde and walk from there: 10-15 minutes to the Vessy sports center. RSVP and we'll email you more details and contact number in case you get lost. In satellite view you can see the softball diamond.